The veterinary technician career path is one of fastest growing niche careers in the animal industry. The Bureau of Labor Statistics (BLS) salary survey estimates that the profession will expand at an astonishing rate of 30 percent from 2012 to 2022. This is much faster than the average for all careers and will translate to approximately 25,000 new vet tech positions. The demand for qualified veterinary technicians is quite strong, making this an excellent career choice. The certification process for most vet tech specialties will require a degree, three to five years of work experience, skill logs and case studies, attendance at continuing education events, letters of recommendation, and passing a comprehensive exam. Here are the key benefits of becoming certified in a vet tech specialty. A 2014 Frontline survey found that credentialed vet techs earned an average of $17.02 per hour, while those with a specialty certification earned an average of $21.34 per hour. Hiring managers tend to offer top dollar for vet techs holding a specialty certification since they have the education and experience to justify that increased hourly rate. While specific salary can vary from one individual specialty to the next, it is true that techs with specialty certification do tend to earn more overall. A vet tech specialist gains more in-depth knowledge and increases their skill set to a much higher level than that of the general vet tech population. This knowledge and experience give a vet tech the ability to work at a level similar to a nurse practitioner in human medicine, operating at the highest possible level without holding a doctorate. This increased knowledge level can boost job satisfaction and makes it more likely that the tech will be called in to assist with unusual or demanding cases. There are relatively few vet tech specialists, so the demand for a qualified specialist is quite solid. Employers find vet tech specialists to be extremely attractive candidates as they have shown a serious commitment to their profession and a strong interest in continuing their education. Specialists may also have more opportunities outside of the clinic environment, being more readily able to move into roles involving research or veterinary sales. 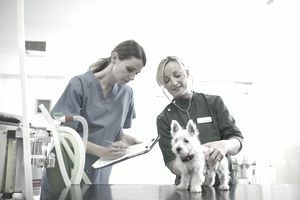 Vet tech specialists can have a major impact on the overall productivity of the veterinary office. Their high level of expertise can greatly increase the veterinarian’s productivity by freeing the vet from many of the smaller details and procedures that a specialty certified tech can handle independently. This allows the vet to see more patients and bring in more revenue, justifying the increase hourly rate that a specialty tech often earns. Vet tech specialists can provide top quality client education, ensuring that owners know how to care for their pets properly after an exam or procedure. A specialized vet tech is able to explain procedures in detail and answer client questions. A technician usually has more time to devote to this task than a busy veterinarian trying to complete dozens of surgical procedures. The personalized attention from the technician can enhance the client’s perception of customer service at the clinic, making this a valuable part of the technician’s duties.